WE HAVE HAD A LOT OF FUN cooking and eating Central Florida blueberries since I first wrote about them in Central Florida Ag News in 2011. We have more berries now, thanks to adventurous Florida farmers who plant, prune, and pluck larger acreages every year. This season, for all “in tents and porpoises” (couldn’t resist that one), is done. Some of us are lucky enough to have grabbed a bucketful and stashed them in the fridge. The rest of us have to head to the freezer. It’s interesting to see how many choices and recipes for blueberries have run in these pages. Twenty-six. That’s a lot of blueberry choices. But you can never have enough, so it’s back to the books for even more. 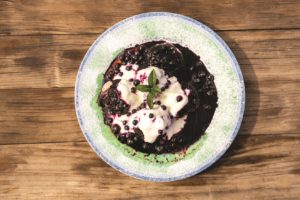 Here are five of my favorite recipes, most from the Canadian Maritime Provinces, where wild blueberries are part of the heritage. Don’t tell our Florida berries where these recipes came from. Cover a baking dish with blueberries and sprinkle with sugar. Sift the rest of the dry ingredients in a bowl and add egg, milk, vanilla, melted butter, and sugar, stirring just enough to combine. Spread batter over blueberries and bake at 350° F about 40 minutes. For a dramatic presentation, invert on a plate and serve with cream or lemon sauce. Or scoop it out with a spoon and top with ice cream. Adapted from New Brunswick Tourism. Prince Edward Island is a tiny province with its own government and heavily agricultural economy. As of last July 1, the population was 148,649. That’s all the people in the whole place. But they sure can cook. This recipe is adapted from PEI Juice Works Limited, a company that sells juice pressed from wild blueberries. Juice from our berries will work just as well. Over low heat, combine ingredients for the sauce, except the cornstarch. Whisk well to combine and turn the heat to medium. Heat until mixture bubbles, stir often, then turn heat back down to low. 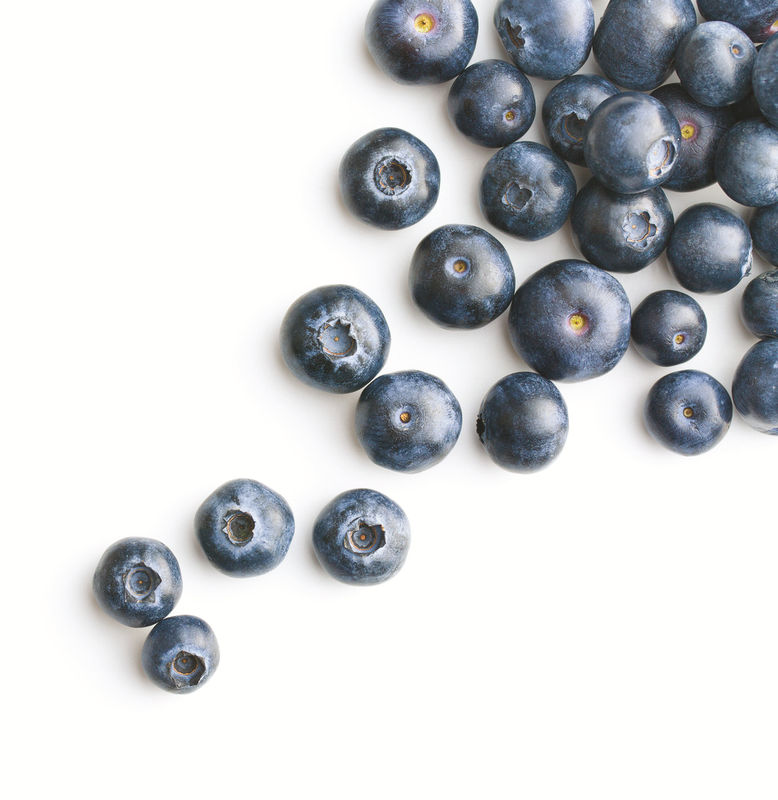 In a separate bowl, mix 2 teaspoons of cornstarch and 2 teaspoons of blueberry juice. Add to sauce mixture while whisking. Simmer 10 to 12 minutes, whisking often to avoid sticking. 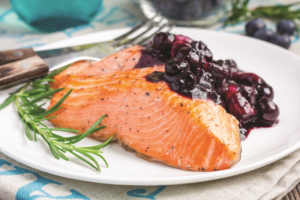 Blueberry BBQ can be stored in an airtight container and refrigerated for one week. Preheat grill to very hot. Brush the salmon with cooking oil so it will not stick. Season the salmon with salt and pepper. Place the fillet on the grill and cook for 5 minutes. Turn salmon over using a wide spatula. Brush blueberry sauce on the fish and let cook until flaky and opaque, about 5 to 6 more minutes. Time depends on the thickness of the fish. Slather cooked fish with more sauce. Nova Scotia, mainland, and islands in one province, means New Scotland in Latin. You can guess where many of the original settlers came from. The Scots have a reputation for being thrifty and this dessert recipe with a funny name won’t break the bank. Our tame berries work just as well as the wild. Boil berries and sauce ingredients gently in a skillet until well blended and reduced slightly. Sift flour, baking powder, salt, and sugar into a bowl. Cut in butter and add enough milk to make a soft biscuit dough. 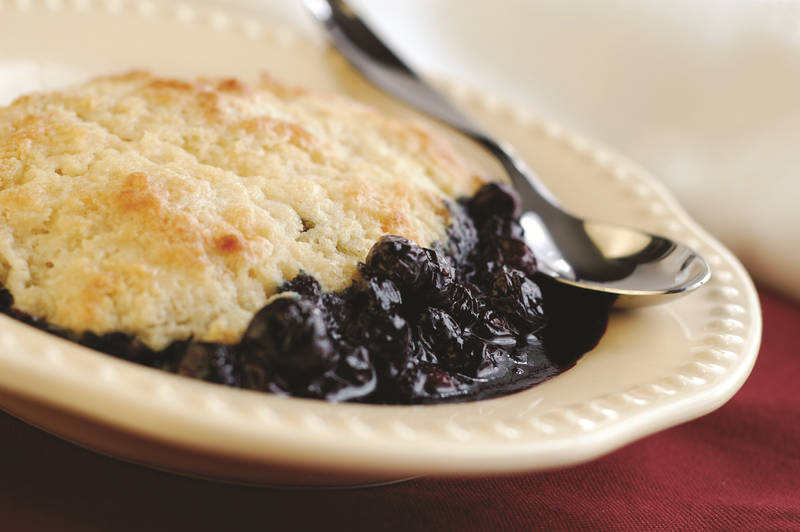 Drop by the spoonful into hot berry sauce. Cover tightly with a lid and simmer 15 minutes. The dumplings should be puffed and well cooked through. Transfer cooked dumplings to serving dishes. Ladle sauce over top; serve with whipped cream or ice cream. From “Fat-Back and Molasses, A Collection of Favorite Old Recipes from Newfoundland and Labrador” we get a delicious, yet simple treat. 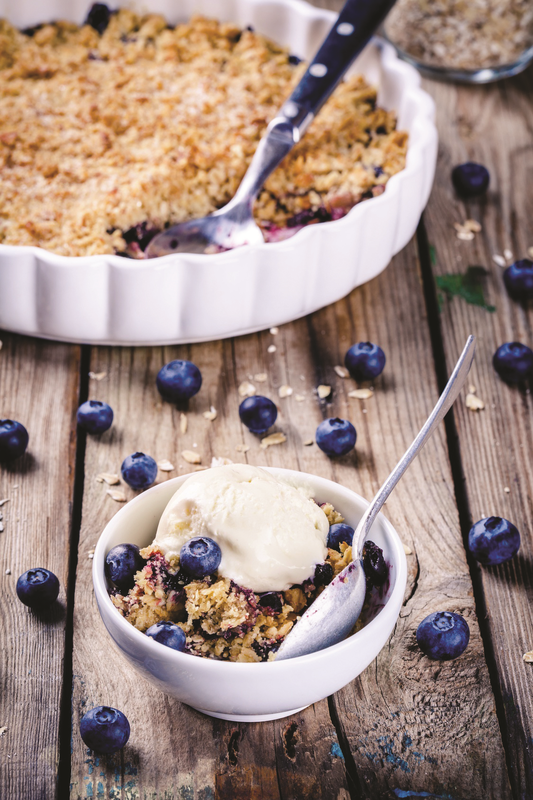 Put blueberries in 8-inch square baking dish and sprinkle with ½ cup of white sugar. Mix flour, brown sugar, salt, and cinnamon. Cut butter into flour mixture until crumbly. Sprinkle this mixture over berries and bake at 350° F for 30 minutes. The last recipe is a favorite that has nothing to do with Canada. We have a variation on it every morning. 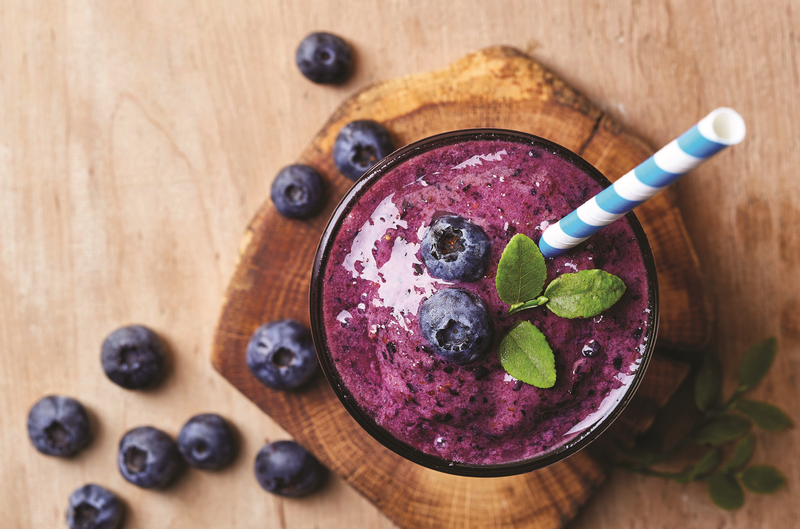 Blend blueberries, banana, yogurt, cinnamon, Florida honey, and other fruit.